I had a slap my forhead moment not longer after I posted my BPA free teether and pacifiers post. Why? Because I forgot one very important teether! One of the comments on that post about non-plastic teethers jogged my memory. 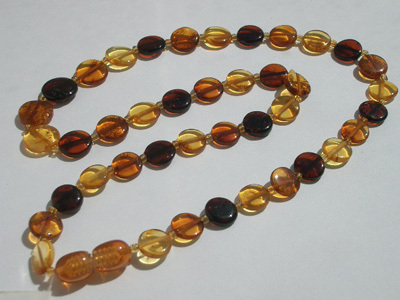 About a year or so ago I ran across amber teething necklaces. They are supposed to alleviate teething pain but here is the kicker…your child does NOT chew on them…only wear them around the neck…like a necklace. Amber is a natural substance from trees. It is actually fossilised sap. Remember in the movie Jurassic park when excavators were looking for amber with ancient mosquitoes inside? Well, this is the same stuff…but hopefully sans the mosquitoes. ;) It has been used for a long time in European countries for its natural pain relief and natural anti-inflammatory properties due to the slow release of its natural oils upon the warming of the stone from the skin. The active constituent present in the resin is called succinic acid, this is what your body absorbs. All over Europe, amber has been used to help with certain ailments such as the pain and inflammation caused by teething. It has been such a prized possession that for some time, pieces of it were used as currency. Like I said before it is not intended for chewing but it is okay for toothless babies to gum them (UNDER SUPERVISION). I know several moms that swear by them and they are truly gorgeous as well so even after your teether has grown they make a lovely piece of jewelry.